JT aftermarket rear sprocket for Honda Grom 125! There's no other way to counter balance your engine power other than transmission adjustments! Affordable and easy to install rear sprocket for Honda Grom 125 should be the first performance modification on your to do list! 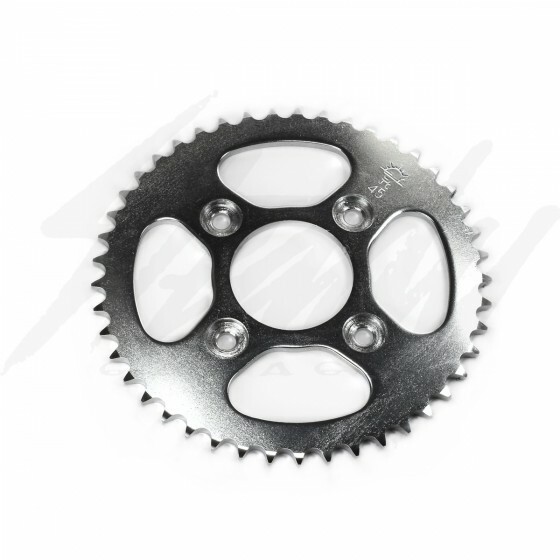 JT aftermarket rear sprocket for Honda Grom 125 is a low cost and easy mod that can improve your acceleration and/or top speed depending on your selection. 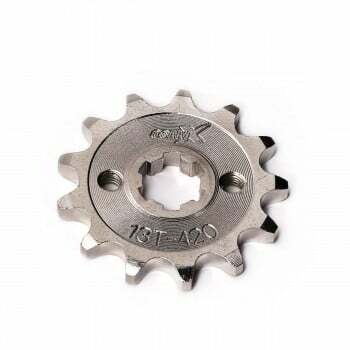 Being made from steel makes it more durable than aluminum sprockets, which inturn will last longer and takes more abuse. Stock Honda Grom comes with the 34t rear sprocket. By changing both your front and rear sprockets, you can find the combination that gives you the gear ratio that works best for you. Lowering your ratio will provide increased top end, while increasing the gear ratio will increase acceleration at the bottom-end. In other words, a high ratio will cause higher RPMs and quicker gear shifts but sacrifice top end speed. With a lower ratio, you'll experience lower RPMs as you increase in speed at a slower rate, however you'll optimize the maximum speed potential between each gear. Changing both front and rear sprockets will allow you to tune it to perform to your needs.